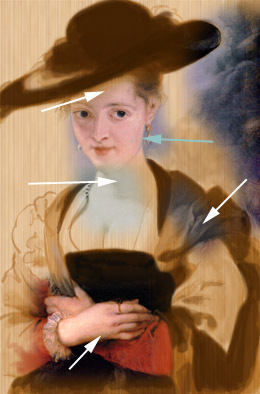 Being a real virtuoso Rubens usually skipped “dead” grisaille layer (shown on the neck and the shoulder) incorporating it partially in the next one. flesh color looks flat on this stage without glazes and highlights. Burnt Umber of Shadow Study and Imprimatura are glowing through the upper layers. Shadow Study and Imprimatura are left almost untouched above the temple. Blue reflection on the jaw (from the sky on the background) was done during Live Color Stage. Bluish Half-Tones of skipped by Rubes “dead layer” are masterfully mixed in the “live color layers”. The long lost formulas for the oil painting mediums of the great masters of the Renaissance and Baroque periods were reconstructed and published by Jacques Maroger in 1948 after a lifetime of research. Maroger, who was Technical Director of the Louvre Laboratories, and President of the Society of Restorers of France, was made Knight of the Legion of Honor. Many artists all over the world have been painting with Maroger’s mediums with great success and permanence for more than fifty years. Unfortunately, some artists have deprived themselves of these marvelous mediums because of spurious products called “Maroger” and because of Ralph Mayer¹s negative words in his book on painting materials. On this subject, Mayer did not do his homework. He did a disservice to artists. His unsubstantiated equation of Maroger’s mediums to megilp was simply wrong. Of the several Maroger Mediums , a few contain linseed oil and mastic, as do megilps. There the similarity ends. In his book The Secret Formulas and Techniques of the Old Masters, (page 100) Maroger also condemns megilps. These 19th century “painters’ butters” differ very essentially from Maroger’s mediums because the oil and lead are not boiled. The formulas derived by Maroger from ancient manuscripts and lab trials, call for cooking the oil with litharge (lead monoxide) until the oil becomes polymerized and pre-darkened This “black oil” is the essential ingredient in Maroger’s Flemish and Dutch mediums, but missing from megilps. Charles H. Olin, a distinguished conservator with many years experience with the Smithsonian Institution and Museum of American Art, has examined sixteen recipes for megilp and found that Mayer’s comparison of megilp to Maroger¹s mediums to be “inaccurate”. Megilps, he says, “are made cold without being boiled with litharge”, and furthermore they “incorporate metallic oxidizers or Japan dryers notorious for their deleterious effects.” The latter are also not used in Maroger’s medium formulas. There are available products, commercial and otherwise, that, unfortunately, claim to be “Maroger” mediums, but are really megilps, or worse. Artists are frequently not good technicians and can concoct all kinds of goop and call it “Maroger medium”. E.g. certain ones contain no black oil because some painters demand a colorless medium. However, it is easy to adjust to the transparent amber color of the Maroger mediums, and they have many important benefits, including permanence.. Again, Olin states, “by polymerizing and cross linking linseed oil during boiling without the advent of oxygen, the black oil forestalls future darkening of paintings.” Olin explains further, as linseed oil is boiled with litharge, as in the case of Maroger Mediums , the subsequent oxidation process may be minimized because the chemical bonds which would normally be available for oxygen, are not available. This prevents mediums from discoloring and other forms of degradation.” In addition to non-darkening permanence, correctly made Maroger Mediums impart ease of handling, quick drying, glazing ability, color brilliance, and other desirable qualities apparent in the great old masters. While I was at the University of Pennsylvania graduate school, studio Professors James Domville and Wally Peters subjected Maroger Mediums to DuPont laboratory aging tests and found them virtually indestructible. When Maroger Mediums are made and used properly, any deterioration of the paint film is usually caused by the artist’s mistakes, e.g. painting “lean over fat”, diluting with too much additive (especially turpentine), varnishing to soon, etc., etc. Cracking, yellowing, and other ailments of paintings have many causes, but internal paint film decay with serious damages, is more evident in 19th & 20th century paintings than those painted in the Renaissance and Baroque periods. Sargent and Picasso’s paintings were cracked while they were still alive. The damaging results of using a harmful medium or vehicle, experts agree, will usually be apparent in less than ten years. For more than fifty years now the Maroger Mediums have had the pragmatic test of being used by thousands of students, amateurs, and professional artists. Included are many well known artist, such as:Reginald Marsh, Augustus John, Fairfield Porter, John Koch, and many others. Also, of course, there are the original Maroger associates, Ann Schuler, Joseph Sheppard, Tom Rowe, Frank Redelius, Earl Hofmann, Melvin Miller, myself, and others For more than fifty years I have made the Maroger mediums for my self and my students, and, from 1984 to 1997, I sold Maroger Mediums on the open market to many hundreds of artists. Of those artists I have known to use it, the vast majority have been thrilled with the results and have been hooked on the Maroger mediums for life. Some of my own paintings in these mediums are over fifty years old and show no signs of deteriorating. I have a work painted by Maroger himself in 1951. It is in NEW condition. Make your drawing on paper as if it is your final product. Copy it on tracing paper and retrace the lines on the back side of it with dry pastel pencil (Carb-Othello). 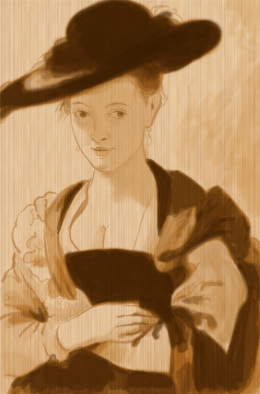 Transfer drawing to the board and rework it with diluted burnt umber paint using a fine brush. Don’t think that drawing is something that is not fully related to the painting with colors. Drawing is “the melody” of the visual art and the colors are “the harmony”. Keep in mind that “the harmony” gives only the moods or impressions of the moment but only “the melody” is able to unfold the whole story. By drawing your subjects “inside-out” you study it on a much deeper level than by just dubbing it with #40 brush. I know that most of us don’t have enough patience. In this case, our paintings will be similar to the “3 chords guitar music” – just O.K. for friends and family. Draw with precision using different pressure and line thickness. Draw with a pencil and with a brush. Imprimatura is the classical term for a semi transparent or transparent color layer used to create a toned ground for a painting. It literally means “what goes before first”. 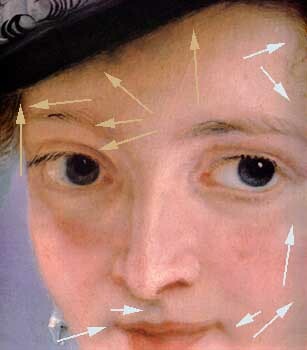 Imprimatura acts as harmonizing element for all upper color layers if they are laid according to the laws of the classical technique allowing the imprimatura to show through in certain places. It also determines an overall darkness (or lightness) of the composition. The advantage of an imprimatura over a toned gesso or a toned primer is that the white ground reflects the light through the imprimatura and upper semi-transparent layers, creating almost a magical 3-dimensional illusion. 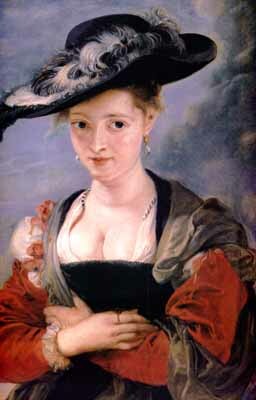 The color of an imprimatura depends on the lighting source in the composition you are going to paint and the subject. If we would consider a raw umber to be a neutral color for imprimatura, then you may want to go to a warmer or cooler sides by mixing yellow ochre with bone black in different proportions. Never choose the darkness of this layer by mechanically picking 50% grey tone. You always can put the second layer or add darker tones during your next step – shadows study. 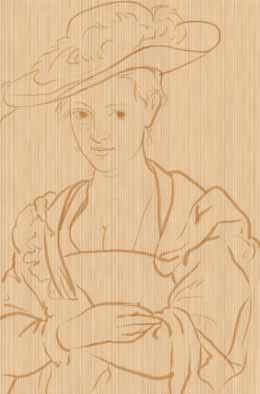 The portions of the drawing which are darker then imprimatura are painted with Burnt or Raw Umber in thin layers. Imprimatura should still be slightly visible through the darkest parts. Small details are usually omitted. Areas where bright reds or bright blues are going to be painted are usually left uncovered. In this stage, only four colors are used: Lead or Titanium White, Yellow Ochre, Red Ochre and Bone or Ivory Black. The trick is to mix them correctly to have a scale of neutral grays. First mix Black and White, then add a bit of Yellow Ochre. Add Red Ochre carefully just until it eliminates the greenishness brought to the mixture by Yellow Ochre. Work thick in the lights and less thick in the shadows. Don’t use semi-transparent “soapy” layers. Leave a small parentage of the darkest parts of the shadows uncovered. By the end, the objects on your painting should look like they are made out of unpolished marble without out details in the highlighted areas and the darkest shadows. Mix real object colors. To the previous colors add : Ultramarine, Prussian Blue, Madder Lake Deep, Red Cinnabar or Cadmium Red, Cadmium or Lead Yellow. Each color for each object must be exactly of the same darkness as they are on the previous layer. 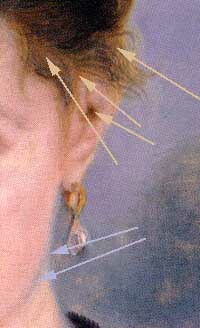 For highlighted areas and shadows use one step lighter and one step darker mixtures. Sometimes you’ll need a lot of layers to complete this stage. Each time narrow the highlighted and shadow areas, painting them lighter and lighter. Glazing can be done with transparent or semitransparent colors. Don’t overdo it and carefully choose the areas for glazing. After the glazing is done, the very dark shadows are finished with the semi-transparent (almost opaque, if needed) colors and at last the very highlights are put on. Egg tempera painting and even icons were often finished with oils. Be cautious though, if somebody will suggest using some “old magic recipes ” for this purpose, such as Maroger Medium or Amber Varnish. You may ruin your work completely without knowledge about how and where to use them. Here are several recipes of Oil Painting Mediums & Varnishes. Let the painting dry as long as you can afford before varnishing it. Damar varnish is O.K. Olifa (heat thickened linseed oil with lead) should not be used in Fine Art at all. There are many new developments in the area of acrylic and polyurethane non yellowing varnishes. Unfortunately most of them are not removable. On the other hand, some of them are extremely durable and might be the best and the only choice for protecting valuable artwork. I’ve used some of these successfully for several years on some of my works. For the time being, I’m leaving the choice to you. * Let each previous layer dry completely. Wait at least 10 days. 30 or 45 is better. * Never dip dry brush in to the paint. Wet it first then dry it a little with a paper towel. * Use different brushes for each color. * Avoid touching painting surface with your bare hands. Use bridge or mahlstick. * Have a very clear plan and know several steps ahead what you are going to do today. * Let the painting dry at least for 2-3 weeks before putting on the next layer. * Don’t try to fix something on your painting with brushes, which you couldn’t do or forgot to do with a pencil. * Never start painting on a white canvas or board. Always put imprimatura after the completion of the detailed drawing.